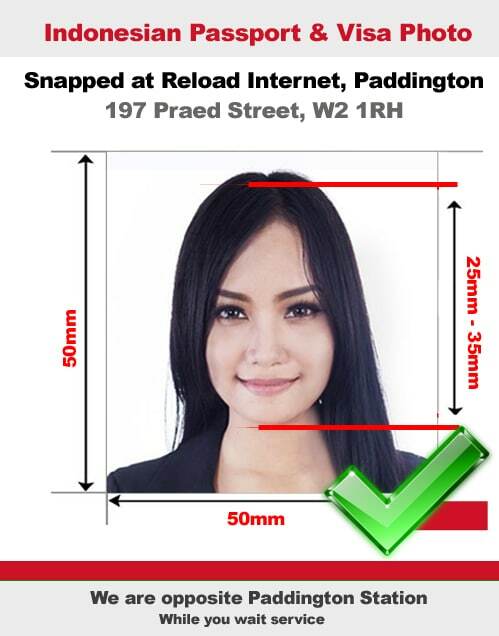 If you are in need of a Indonesian passport photo or visa photo and live in London, then come to Reload Internet in Paddington. We are a professional passport photo studio that has been in operation for over a decade and specialises in Indonesian passport and visa photographs. We can take and print your Indonesian passport photo or visa photo instantly in store, and have your photographs ready within 10 minutes of your arrival here! You won’t even need an appointment, just stop by our store and one of our trained photographers will be happy to assist you. We will provide you with a set of 6 Indonesian passport or visa photos which are high-quality and meet the necessary requirements stated by the Indonesian Embassy. We guarantee that the photographs we produce for you will pass the first time that you submit them with your application. And our service costs just £9.99! 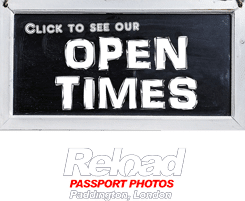 Our studio is open 7 days a week from early morning until late evening, allowing you to visit and have your Indonesian passport photo or visa photo captured, printed and prepared at a time that suits you! You must ensure that your Indonesian passport photo or visa photo meets the specifications listed below, otherwise your application will most likely be rejected due to a photo error. At Reload Internet we guarantee this will not happen to you! Ensure that the photo is clicked less than six months ago. In the photo, the distance between your chin to the top of your head should be between 1 to 1 3/8th inches. Click the photo wearing your normal daily clothes. Do not wear any uniforms for the photo. It is best recommended that you do not wear glasses while clicking the picture. You should look straight into the camera and should have a neutral expression. Your teeth must not be seen in the photo and the hair should not cover your eyes. Do not wear any scarves or hats. Even if you wear religious head gear, make sure that it does not cover your face in any manner. The photo should be printed using high quality paper and must not be pixilated. Do not wear jewelry or make-up. The expression should be neutral and you should not be smiling or laughing; ensuring that your teeth are not seen in the photo. The eyes should be open and do not raise your eyebrows. Your face should be straight in the portrait oriented photo and should form a square shape to the camera. Both your ears should be seen equally in the photo without any tilt in your face. Print the photo with a high resolution: above 600 dpi and on a high-quality paper and the color must be natural. There should not be any modifications or touch ups done on the photo to hide a pimple or scar and it must be color photos. Ensure that there are no shadows present on your face when you click the photo. Should your Indonesian passport photo or visa photo fail to meet the requirements above, then your application will probably be denied. THis can cost you time, money, stress and may even affect your travel plans. Come to Reload Internet to ensure that the Indonesian passport photo or visa photo you submit with your application passes first time. Our specifications are taken from the Indonesian Embassy’s guidelines on passport and visa photographs, which you can see here. Comprising of more than 1,700 islands that are spread along a equatorial line of 5,000 miles, Indonesia is scenic and rich in beauty, thereby making it an ecological paradise and a promising destination for all types of travelers. If you like exploring outdoors, Indonesia is a wonderful place to visit and there are coral reefs spreading across the crystal clear water; which would compel you to go scuba diving or snorkeling. The clean and serene beaches that are thronged by tourists from all over the world relax in the resorts that are present in remote locations, giving up a gist of adventure as well. Also, you can visit the rainforests, volcanoes; have encounters with the rich wildlife to have an extravagant experience in Indonesia.